It can reasonably be argued that the British invented the novel. And to understand the way in which the novel, as a literary form, developed in Britain is key to understanding the literary form itself. 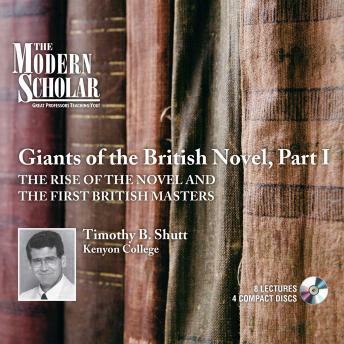 In this first of a two-part series, beloved Modern Scholar professor Timothy B. Shutt takes listeners on a panoramic journey across the colorful landscape of British Novelists beginning with Daniel Defoe in the early 18th century all the way to the mesmerizing works of Jane Austen in the early 19th Century. Professor Shutt begins by exploring exactly what a novel is – and what it isn’t – and what defines this unique literary expression. He explores both its antecedents and precursors and where exactly its place in the literary landscape can be found. He then moves on to Defoe’s great work Robinson Crusoe which arguably marks the birth of the novel. Subsequent lectures explore works by powerful literary forces such as Samuel Richardson, Henry Fielding, Laurence Sterne, and Sir Walter Scott. Each is brought to life with Shutt’s trademark style, flare, and formidable insights, leaving the listener not only with a solid grasp of this literary form, but also feeling as if they have been on an epic journey through some of the most amazing literary works ever penned.